September is here! The kids are heading back to school and cooler weather and autumn leaves will soon follow. Of course, taking weather and environmental changes into account for your catio can help your kitty (and you!) make the most of it as often and as long as possible. 1. Consider adding a removable weather shelter. A canvas awning or polycarbonate roof over your catio will provide weather protection and help moderate temperatures while keeping your cat nice and snuggly inside. 2. As the weather gets cooler, add a heated shelter or bed that your cat can enjoy. Your cat will love this cozy spot to help her stay warm and still be able to sniff the fresh autumn air. Make sure the heated shelter or bed is in an area that is completely covered and water-proofed! Safety first. 3. Never lock your cat out. Access to the cat door is always important, especially as the weather begins to chill. Your cat should have free access to come in as desired. 4. Never place food in your catio, especially in the fall as critters might be looking for more in preparation of winter. No one wants a rodent squeezing through the wire fencing to fetch food. Wildlife will stay safely outside the catio so long as there’s nothing, like food, enticing them to come in. 5. Always provide water. Just because it’s cooler doesn’t mean your cat will necessarily be less thirsty. Provide fresh, clean water frequently. 7. As leaves fall, keep your catio roof clear of falling debris so sun shines through. This will help maintain integrity of the catio structure and give your cat some more rays before winter settles in. With school back in session, there’s likely to be an increase of noise, children and passersby, not to mention school buses and more street activity! My own kitty, Serena, enjoys watching the kids (and birds) from her window box catio in my front yard. Front or side-yard catios provide a great place to watch all the action and are sure to keep adventurous kitties intrigued for hours. No matter the season, catios can provide a great escape, enriching playground or ideal sunning spot for your cat (and you!) to enjoy for years to come. 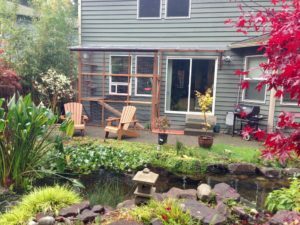 Interested in a custom-designed catio for your cat? I design for all types of residences and cat needs in the greater Seattle area. 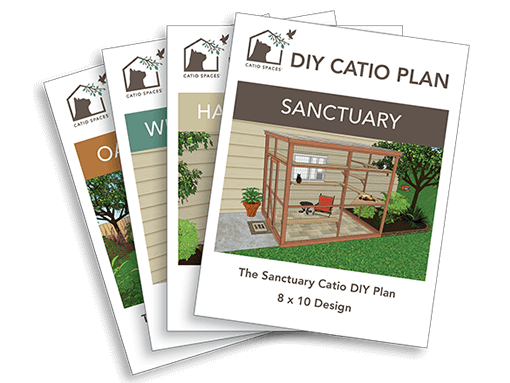 If you’re not local, our downloadable DIY plans provide catios of different shapes and sizes to fit a variety of outdoor locations and cat family sizes. Our plans contain a materials list and foolproof instructions that either you or a hired carpenter can follow to build a sturdy and protective catio. They help provide a safe, natural environment for cats to explore and add to the aesthetic of a home and garden. A DIY catio can be a cost-effective and purrrfect solution to the indoor/outdoor dilemma for cat parents and cats alike. Looking for free catio tips? Sign up for our monthly newsletter featuring DIY success stories and tips for maximizing the enjoyment of a catio all year long.